His name was Theophrastus Philippus Aureolus Bombastus von Hohenheim and his contemporaries called him Paracelsus, but history knows him by this title: the Father of Toxicology. Paracelsus was a 16th century Swiss physician who profoundly influenced our understanding of how chemicals affect the body. His dictum, "The dose makes the poison," helped explain that even toxic substances could be safe as long as the amount ingested remained below a certain threshold. It's still a major principle of modern toxicology, and it's why the Food and Drug Administration (FDA), the Environmental Protection Agency and other government safety offices fight with industry to find that safe level below which the toxins that are part of modern life can be tolerated. But as science advances, we can detect smaller and smaller doses of chemicals in the human body  as small as one part per trillion, or about one-twentieth of a drop of water in an Olympic-sized swimming pool. A Centers for Disease Control and Prevention biomonitoring survey found that Americans have traces of 212 environmental chemicals in their bodies  including so-called endocrine disrupters like bisphenol-A (BPA), which may have a major impact on human health even though the dose is barely perceptible. But our ability to detect chemicals outpaces our ability to understand exactly what exposure means for us  which puts regulatory agencies in a tight spot, especially when the chemicals in question are widely used in modern life and are hard to replace. That's exactly where the FDA finds itself with BPA. The chemical has been used since the 1940s to harden polycarbonate plastics and to manufacture epoxy resin, employed in the lining of food and beverage containers, among countless other products. BPA is good at what it does  that's why some 6 billion lb. (2.7 billion kg) of the chemical are produced globally each year. But BPA is also a synthetic estrogen  meaning it can mimic or disrupt the effect of that hormone  and both animal and some human studies have associated BPA exposure with health and developmental problems, including cancer, heart disease, diabetes, early puberty, even learning disabilities. That's despite the fact that human beings are exposed to such tiny amounts of BPA  perhaps 0.2 micrograms per kg of bodyweight per day for adults, well below the 24-year-old federal safety threshold of 50 micrograms per kg. If BPA is a threat to human health  and many scientists believe it is  the damage is being done in microscopic doses. So when the evidence is scary but uncertain, what will the federal government do? When it comes to BPA, the answer is not much. On March 30, the FDA announced that it was rejecting a petition from the Natural Resources Defense Council (NRDC) to ban BPA from food packaging. The environmental group had filed the petition in 2008, asking the agency to ban BPA from food-contact uses  and when the agency failed to reply, NRDC filed a lawsuit last year that forced it to decide by the end of March. The FDA declined, arguing that the studies presented by the NRDC and its allies were too thin and too small to be conclusive, with too little research done on humans. "While evidence from some studies have raised questions as to whether BPA may be associated with a variety of health effects, there remain serious questions about these studies, particularly as they relate to humans," the FDA wrote in a statement following its ruling. The agency put more emphasis on government-conducted studies that indicated BPA was metabolized and excreted from the body too quickly to do much damage. 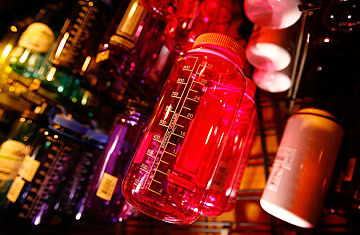 Of course, there are reasons proper human studies of BPA can be hard to come by. The chemical is ubiquitous in the environment, which means it's nearly impossible to find human beings who haven't been exposed to it  by some counts over 90% of us have BPA in our bloodstreams. That makes it awfully hard to assemble a good control group of unexposed people to compare with the exposed majority. And without a control group, good science can't be conducted. Those studies that exist do tend to associate BPA with certain health problems, but that doesn't mean scientists can prove causation. For most public-health advocates, chemicals like BPA should be guilty until proved innocent  and they feel there's more than enough data out there to cast doubt on BPA's innocence. That's led to frustration with the slow pace of the FDA, which only two years ago expressed "some concern" over the health risks posed by BPA. "It makes me uncomfortable to think that while the research and regulatory process drags on (for how many more years) consumers are continuing to be exposed," wrote NRDC senior scientist Gina Solomon after the FDA ruling. "Let's hope the FDA remembers their responsibility to public health and takes action soon." Meanwhile industry groups like the American Chemistry Council  which takes the innocent-until-proved-guilty line on chemicals  cheered the FDA's nonaction. But while BPA has a reprieve for now, as we learn more and more about the effects of it and other endocrine-disrupting chemicals, I think we'll see regulation follow in the wake of science. Already consumers are avoiding BPA on their own, while companies like Campbell Soup and Heinz have been phasing out the chemical in advance of government action. Even as it declined to ban BPA, the FDA said it would keep researching the chemical. "I cannot stress enough that this is not a final safety decision on BPA," FDA spokesman Douglas Karas said after the ruling. Science moves slowly and regulation moves even slower, but sometimes neither will be stopped.